Product prices and availability are accurate as of 2019-04-21 11:29:14 CDT and are subject to change. Any price and availability information displayed on http://www.amazon.com/ at the time of purchase will apply to the purchase of this product. The Loctek D5D Deluxe Series is our best-selling series. These quality mounts are perfect for creating ergonomic workstations. With them, you can easily share screens with coworkers, rotate displays to portrait orientation for web design and coding, reduce glare, save space and create the most comfortable setups for your needs. The monitor arms greatly enhance the functionality of a typical desktop computer. 1. Flexible & smooth movements: let you rotate, extend, swivel and tilt any screen with just a light touch, placing your displays exactly where you want them. Supports monitors of up to 4.4 to 11 lbs for each arm. 2. Spacious cable management channels: allow wires to move freely while adjusting your screen position. 3. 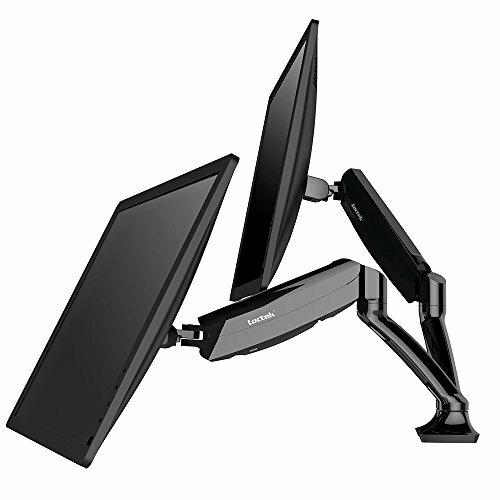 Wide compatibility: can hold most Samsung, Acer, Viewsonic, LG, Dell, HP, Asus, AOC flat panel LCD and LED displays from 10" to 27" (13, 15, 17, 19, 20, 22, 23, 24 and 27 inch monitors) with ease. Search the brand name and model number of your screens in our "Customer Questions & Answers" area to check compatibility. 4. 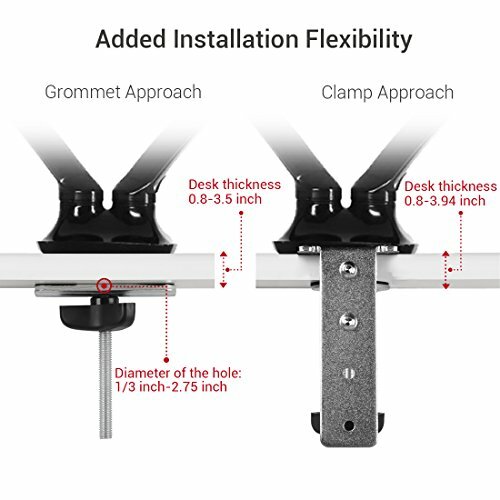 Added installation flexibility: as the included mounting hardware can either clamp to the side of your desk/table or mount through a grommet hole. 5. 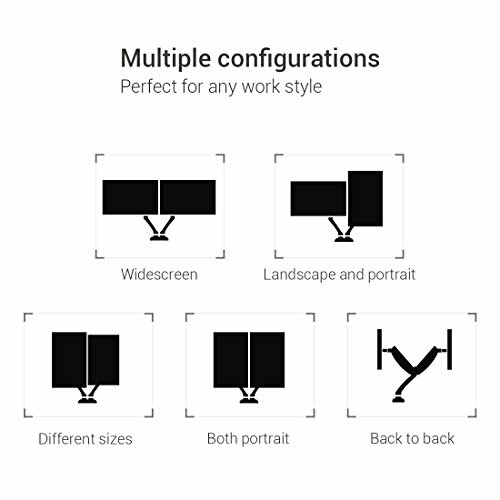 Multiple configurations: give you the freedom to place your displays side-by-side, spread apart, back to back or anywhere in between. For viewing longer pages or blocks of code without scrolling, the arm also supports landscape to portrait display rotation for either monitor.